Optimize production with confidence. The KIP 7590 delivers intelligent productivity that expands enterprise workflow capabilities and efficiency. 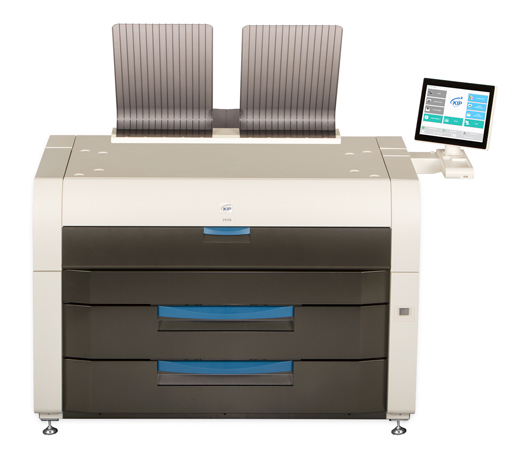 The modular footprint design includes a KIP 2300 CCD scanner that sets a uniquely high standard for color scanning speed, face up/face down/thick media document feeding versatility and digital imaging quality. The increased performance of the KIP 7590 reliably completes projects in less time while reducing cost. No need to install any application software with KIP System K PrintPro.net. Pre-flight and start new print jobs quickly by accessing individual presets that include operator preferences.